Amalthea - Solar System Planets And Moons Section. Amalthea is Just a Pile of Icy Rubble. Artist illustration of Galileo and Jupiter's moon, Amalthea. Image credit: NASA/JPL. By studying data gathered by NASA's Galileo spacecraft, researchers have come to the conclusion that Amalthea, one of Jupiter's moons, is probably just a jumble of icy rubble, held together by gravity. scientists originally believed it was made of rock, but Galileo helped to discover that its density is actually lower than water. It probably formed further out in the solar system, but was then captured into a stable orbit by Jupiter's immense gravity. scientists studying data from NASA's Galileo spacecraft have found that Jupiter's Moon Amalthea is a pile of icy rubble less dense than water. scientists expected moons closer to the planet to be rocky and not icy. The finding shakes up long-held theories of how moons form around giant planets. "I was expecting a body made up mostly of rock. An icy component in a body orbiting so close to Jupiter was a surprise," said Dr. John D. Anderson, an Astronomer at NASA's Jet Propulsion Laboratory, Pasadena, Calif. Anderson is lead author of a paper on the findings that appears in the current issue of the journal Science. "This gives us important information on how Jupiter formed, and by implication, how the solar system formed," Anderson said. Current models imply that temperatures were high at Amalthea's current position when Jupiter's moons formed, but this is inconsistent with Amalthea being icy. The findings suggest that Amalthea formed in a colder environment. One possibility is that it formed later than the major moons. Another is that the Moon formed farther from Jupiter, either beyond the orbit of Jupiter's Moon Europa or in the Solar nebula at or beyond Jupiter's position. It would have then been transported or captured in its current orbit around Jupiter. Either of these explanations challenges models of Moon formation around giant planets. "Amalthea is throwing us a curve ball," said Dr. Torrence Johnson, co-author and project scientist for the Galileo mission at JPL. "Its density is well below that of water ice, and even with substantial porosity, Amalthea probably contains a lot of water ice, as well as rock." Analysis of density, volume, shape and internal gravitational stresses lead the scientists to conclude that Amalthea is not only porous with internal empty spaces but also contains substantial water ice. One model for the formation of Jupiter's moons suggests that moons closer to the planet would be made of denser material than those farther out. That is based on a theory that early Jupiter, like a weaker version of the early Sun, would have emitted enough heat to prevent volatile, low-density material from condensing and being incorporated into the closer moons. Jupiter's four largest moons fit this model, with the innermost of them, Io, also the densest, made mainly of rock and iron. Amalthea is a small red-tinted Moon that measures about 168 miles in length and half that in width. It orbits about 181,000 kilometers (112,468 miles) from Jupiter, considerably closer than the Moon orbits Earth. Galileo passed within about 99 miles of Amalthea on Nov. 5, 2002. 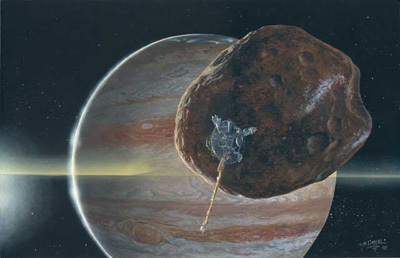 Galileo's flyby of Amalthea brought the spacecraft closer to Jupiter than at any other time since it began orbiting the giant planet on Dec. 7, 1995. After more than 30 close encounters with Jupiter's four largest moons, the Amalthea flyby was the last Moon flyby for Galileo. The Galileo spacecraft's 14-year odyssey came to an end on Sept. 21, 2003. JPL, a division of the California Institute of Technology in Pasadena, managed the Galileo mission for NASA. Additional information about the mission is available online at: http://galileo.jpl.nasa.gov/.